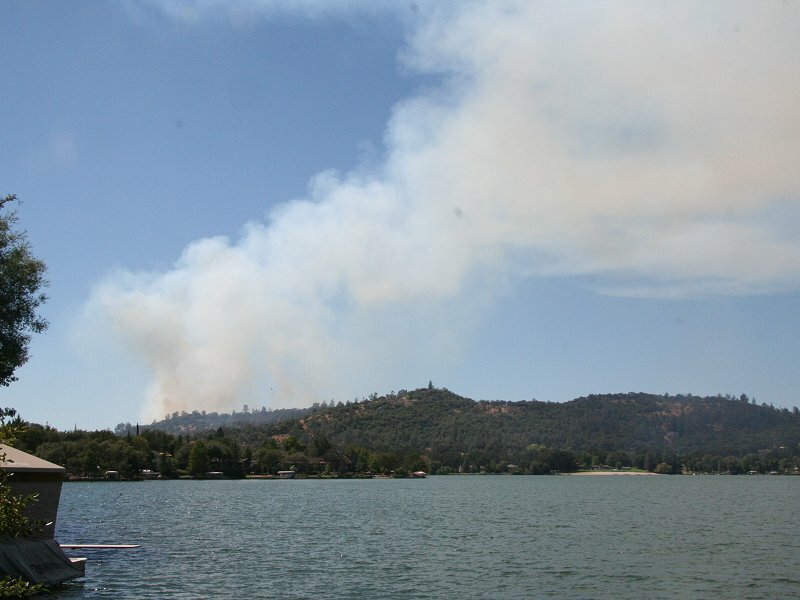 Smoke billows across Lake Wildwood from the Mooney Fire, 3:15 p.m. Meanwhile, a few boaters continued their fun, but I was more concerned about fire containment after the disastrous 49er Fire here in Lake Wildwood a few years before we became home owners in 1993. A boater continues to cruise the lake. 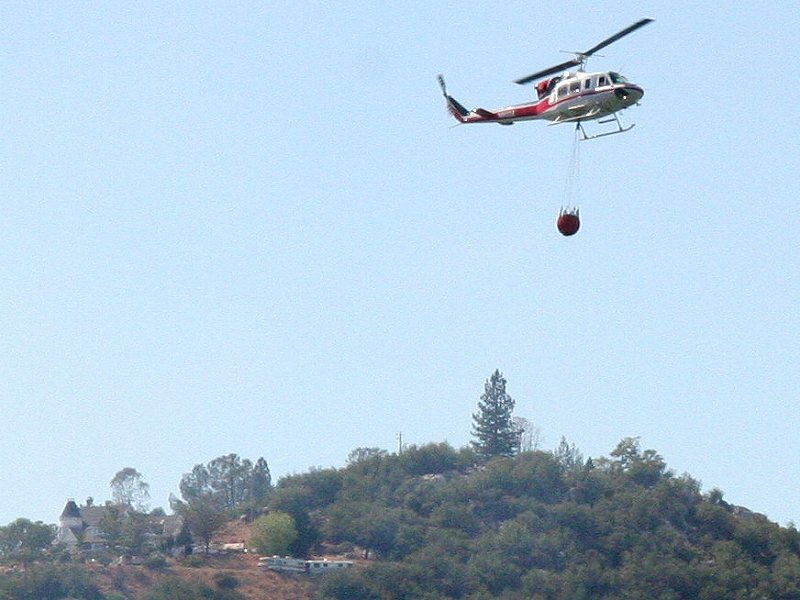 At first, a helicopter with a hanging basket of water just circled round and round the fire a few hundred feet above it. This led me to believe it was a house fire and the helicopter was there to douse any fire that spread into the woods. But there was too much smoke for that, so more likely the helicopter was waiting for ground command to arrive and give drop orders. In any event, before the fire was contained at about 5 p.m. I saw four helicopters in action. They swooped down to fill their baskets from the lake near the dam, circled up and around to the fire, and dropped their water loads. 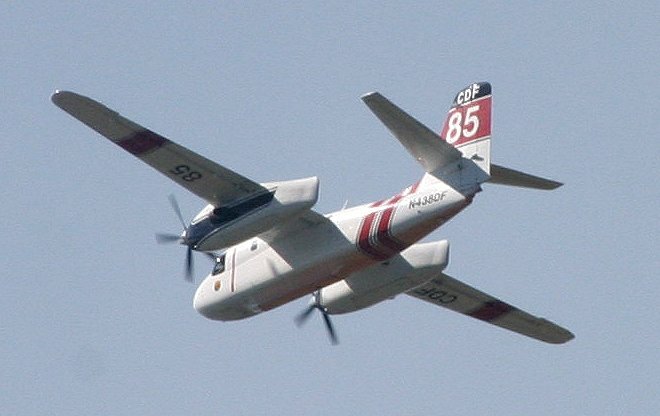 I also saw two or three fixed-wing tanker planes in action dropping fire retardant, plus a fixed-wing spotter plane. One of the water-dropping helicopters in action, 3:27 p.m.
but I'm at my home almost a mile southeast of the helicopter. One of three tanker planes in action, heading toward the fire. 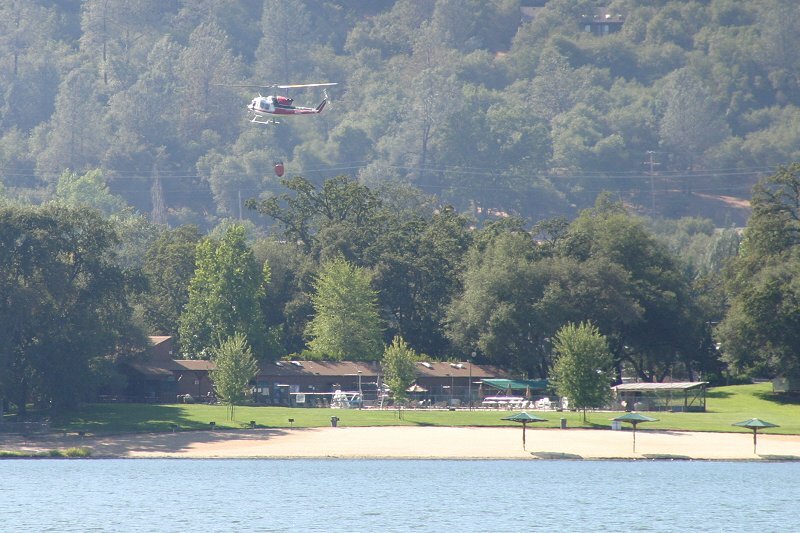 As the fire came under control, helicopters filled their baskets from the marina. This helicopter passes over Commodore Park Beach just before dropping down to the marina, 4:13 p.m.
By 5 p.m. mostly steam was rising from the fire, and not much of that. The helicopters continued to drop water onto the embers until about 5:30 p.m. On one of the last drops a helicopter put on a water pickup display right in front of our house, but by then I'd put away my camera and was barbequing our pork loin dinner and missed a nice close-up. Damn! 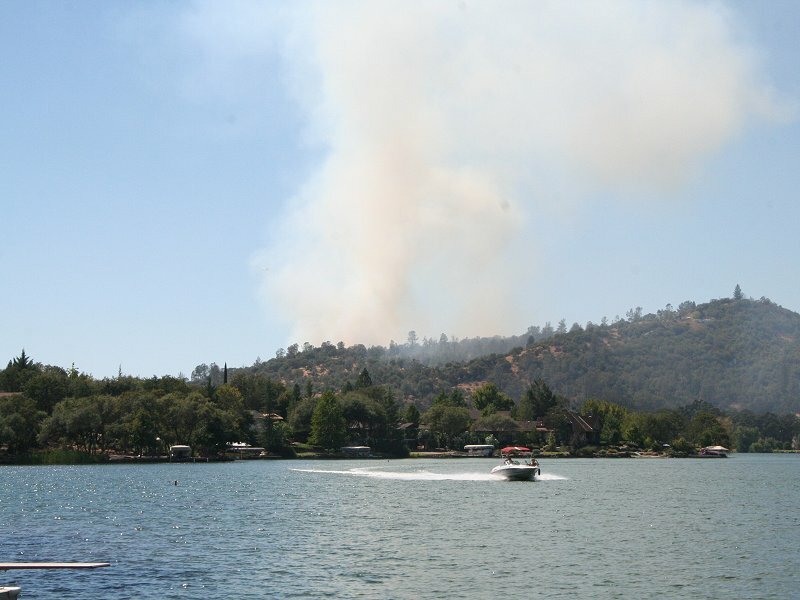 Combined with the marina water pickup above, it was almost as though once the fire was under control Calfire put on a display for Lake Wildwood residents. They deserve a little display -- job well done!! It was interesting to see how difficult it is for the media to be accurate with a breaking story like this. Channel 3 news stated there were five helicopters, five tankers, and as many fire trucks on the ground. 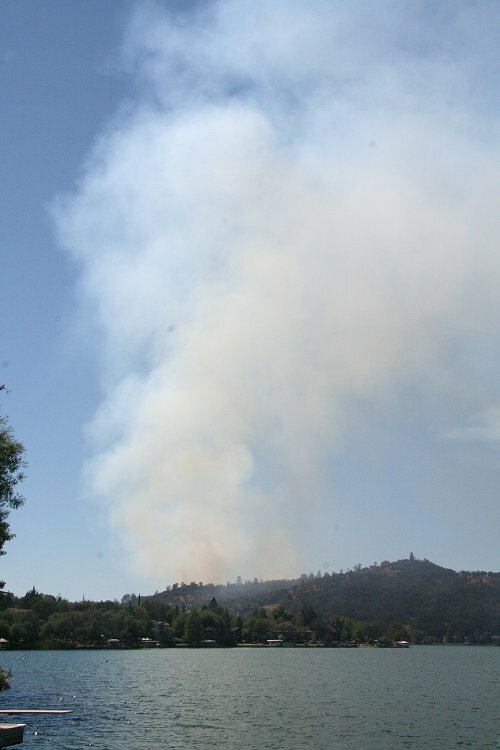 Channel 10 reported that 60 acres burned. This morning's The Union reported that, "Several fire engines, air tankers and two water-dropping helicopters doused the 60-acre Mooney Fire Thursday afternoon..." In the same article, Calfire Public Information Officer Gina Chamberlin is quoted as saying that Calfire dedicated numerous fire engines, an air attack plane, hand-crews, bulldozers, air tankers and two helicopters to fighting the blaze. I'll stick by my observation of four helicopters, at least three of which I saw at the same time with hanging water baskets. The fourth may have been news media, but I think the media helicopters were out of my view (and fire fighters' way) south of the fire.